The Taoiseach is digging in over his leadership of Fine Gael in a move that has sparked fresh unrest among his TDs. In a bold move, Enda Kenny yesterday said the political stalemate in the North must take precedent over his publicly- announced plans to step down. The claims immediately sparked a furious response from TDs who want Mr Kenny to depart within weeks. "Over my dead body will he be allowed to cling on," a senior TD told the Herald last night. Speaking to reporters in New York, Mr Kenny said Brexit and the North are his "immediate priorities" and indicated that he will not be making a prompt statement on his resignation when he returns from America. Several backbench TDs indicated last month that they would be prepared to table a motion of no-confidence in Mr Kenny if he does not set a def- initive date for stepping down. It is accepted within party circles that Mr Kenny should attend an EU Council meeting next month to deal with the initial fallout from British prime minister Theresa May's decision to trigger Article 50. However, he has now also attached himself to the result of the Northern Ireland elections. "I have to deal with a number of priorities here. The first is to form an executive in Northern Ireland," he said. The main parties in Northern Ireland, including Sinn Fein and the DUP, are attempting to form a power-sharing government, but few people believe this will be possible within the three- week deadline set on March 2. Sinn Fein continues to insist that Arlene Foster cannot be the First Minister, meaning a bitter stand-off is likely. Mr Kenny said it is "fundamentally important in terms of Brexit" that a new government is formed. "The voices of Northern Ireland have to heard through that executive. That's an immediate priority," he said. "You can't have a situation where you have no leadership in Northern Ireland. We have to define from a European Union point of view where Ireland will be." 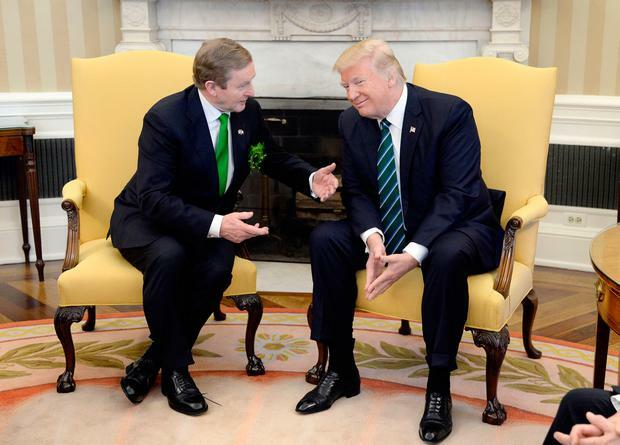 On the final day of his American tour, Mr Kenny defended inviting US president Donald Trump to visit Ireland. "It's a normal courtesy in our country that if you receive an invitation from somebody you return that invitation at another time," he said.